Animal Farm is a parody; an allegory for the Russian Revolution and Stalin. It was partly written as a rebuke to the fervour of pro-Stalinist hysteria that Orwell witnessed in the British intelligentsia during the last years of the Second World War. A hysteria which prevented the novel from finding a publisher for two years. The three most important characters are the triumvirate pigs. The Old Major, who appears in the first chapter and is modelled on Marx, represents the ideal. Then there is Napoleon, who is Stalin. He also represents the ideal perverted. Finally, we have Snowball. He represents Trotsky and symbolises the threat. The external agitator that justifies the need for tyranny. It is interesting to note that once Napoleon’s dogs hound Snowball out of the farm, he is seen no more. He appears only in name. This is a subtle, easily overlooked detail, but one I’m sure Orwell fully intended. You might think that with the fall of the Berlin Wall and the end of the Cold War, Orwell’s fable would have little relevance today. And you’d be dead wrong. Current world events mean that Animal Farm, like many works of political literature, is more important now than ever. Animal Farm serves as a political template. The three pigs can be replaced by almost anything and the meaning holds true. For instance, The Old Major becomes the Founding Fathers, Napoleon George W Bush and Snowball Al Qaida. Or Socialism, New Labour and Al Qaida. I write this a little over a week since the London Underground bombings. No one believes that the threat of terrorism isn’t real, but it is massively exaggerated for political purposes. And when it comes to terrorism, the west are the progenitors and the experts. As with the Russian Revolution, we find the plot of Animal Farm played out throughout human history. Using the muscle of the masses, an elite group overthrows the ruling class. A brief period of near equality ensues, before the status quo is re-established, with the elitists assuming the role of tyrant. Communism lasted a very short time before the Bolsheviks took up the mantle of the Tsar. In 1776, the wealthy land holders (the slave owners) wrestled power from the English and the United States of America were born. Little changed for the vast majority. And thirteen years later, Parisians stormed the Bastile, the aristocracy fell foul of Madame Guillotine and the bourgeoisie took up residence in their palaces. We can also find the porcine trinity of Animal Farm mirrored in religion. That is, the ideal, the ideal perverted and the external threat. Take Christianity. It is the ideal perverted. How many supposed Christian’s actually follow the teachings of Christ? Very few. Evangelicals rarely make mention of the teachings of their redeemer. If they did, they might be asked why they don’t follow them. Love thy neighbour, turn the other cheek, resist not evil. Not to mention the oft ignored, give all your money to the poor. It is virtually impossible to be a true Christian living in a capitalist society. The two are mutually exclusive. Which is where evil is in invoked. The justification for the suspension of ideological adherence. What Animal Farm reminds us is that while we are looking beyond our borders for Snowball, for Satan, Al Qaida or Trotsky, the true threat is often holding the whip that beats us. “He who fights dragons,” wrote Nietzsche, “becomes a dragon himself.” Orwell was fond of quoting the aphorism and it would be perfectly placed at the beginning of the book. Israel’s treatment of the Palestinians, suicide bombers, McCarthyism; history is littered with examples. And unless we start learning from our past, instead of living in it, the future is doomed to more of the same. For this reason, Nietzsche’s statement is one of the most relevant in all of philosophy. 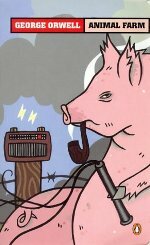 And for the selfsame reason, Animal Farm is Orwell’s most accomplished and far reaching work. Indeed, it is one of the finest works of literature ever written. And Another Thing... Question Time?